Nikon Vision Co., Ltd., a subsidiary of Nikon Corporation, is pleased to announce the release of its MONARCH 7 binoculars 8×42 and 10×42—premium models within the established MONARCH series. The MONARCH 7 is the result of Nikon's pursuit of two values—technical perfection and practical usability. Incorporating high optical performance in a compact body to follow Nikon's exclusive premium model EDG series, the New MONARCH 7 adopts ED glass (extra-low dispersion glass) and dielectric high-reflective multilayer prism coating. This delivers superbly bright, beautifully defined images, as well as the wider apparent field of view, unprecedented for this class of binoculars. 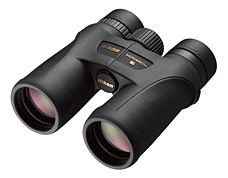 The Nikon MONARCH 7 is best suited for serious enthusiasts, assuring a superior view. *Nikon has adopted a calculation method based on ISO 14132-1:2002.